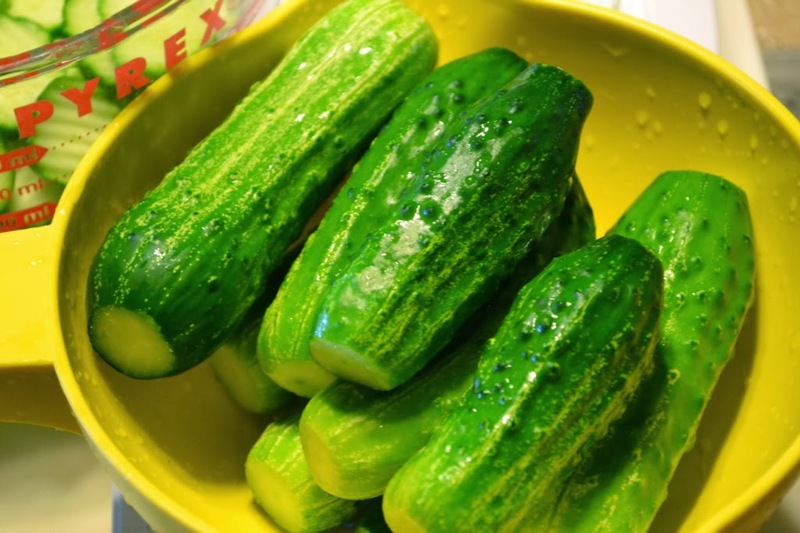 Fall is my favorite time of year to grow cucumbers . . .
That means my cukes are ready to make into PICKLES in November! This was the first batch of pickles I picked . . . about 2 pounds worth. I've always had trouble with little green worms eating away at my cucumber leaves. That's a huge problem for organic gardeners . . . In past years I'd look over the back of each individual leaf, hand picking off the worms. It literally took hours! This year I planted marigolds in with my cucumber plants, and that has taken care of the worm problem! Marigolds are the perfect companion plants for tomatoes, potatoes, melons, squash, and cucumbers. Just make sure you use the kind with a strong smell. They will deter a multitude of pests! After a bit of serious searching, I found these cukes, and had enough for a batch of pickles! I grew up in a family where some sort of pickle or olive was served with our evening meals. On Sundays, after church, the table was set with the fancy china and flatware. For that meal, the crystal relish dish, with seperate compartments, was heaped with an assortment of cinnamon apple slices, olives, dill pickles, bread and butter pickles, celery, and carrot sticks! Momma was always pickling something! She'd make corn relish, pickled beets, watermelon pickles, bread and butter pickles and my Dad's favorite . 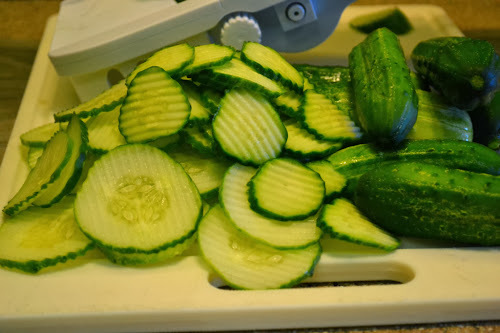 . . her thinly sliced cukes in a brine of vinegar, water and salt! Will and I both love our burgers with dill pickle chips and onions, so I thought dilled cucumber chips with thinly sliced dilled onions would be a perfect recipe to make with some of our pickling cucumbers! 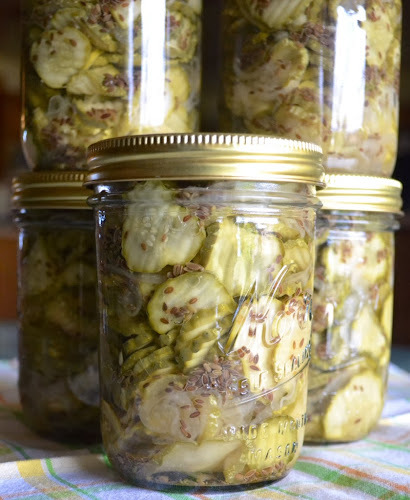 NOTE: These pickles take 2 days to make. The cukes, onions and 1/3 cup of pickling salt must sit overnight. 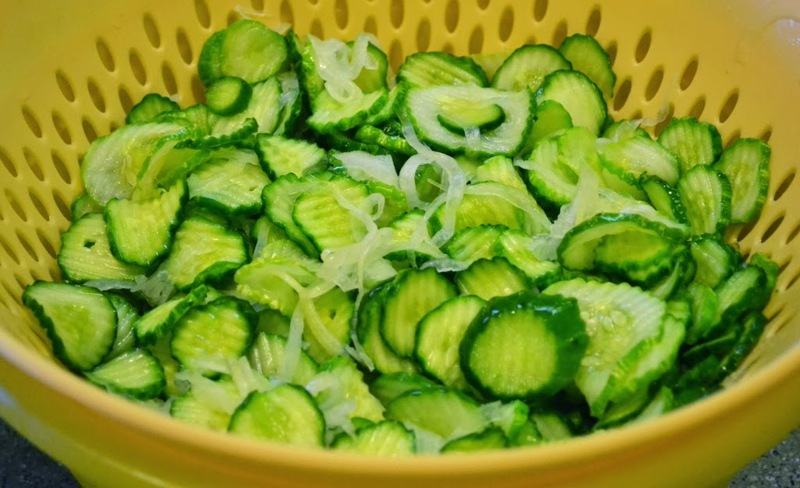 This will remove excess water from the pickles and onions making them extra crispy! 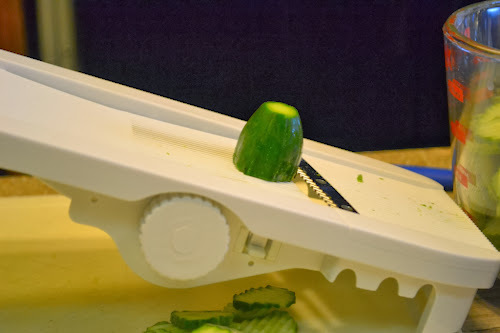 I like to use this inexpensive mandolin to slice my pickles and onions, but a knife will work just as well (it will just take longer). I use a crinkle cut blade for the pickles and a straight blade for cutting the onions. A mandolin is safe to use, without the guard, if you slow down when you get to this point. The last couple of slices, I do by hand with a paring knife. 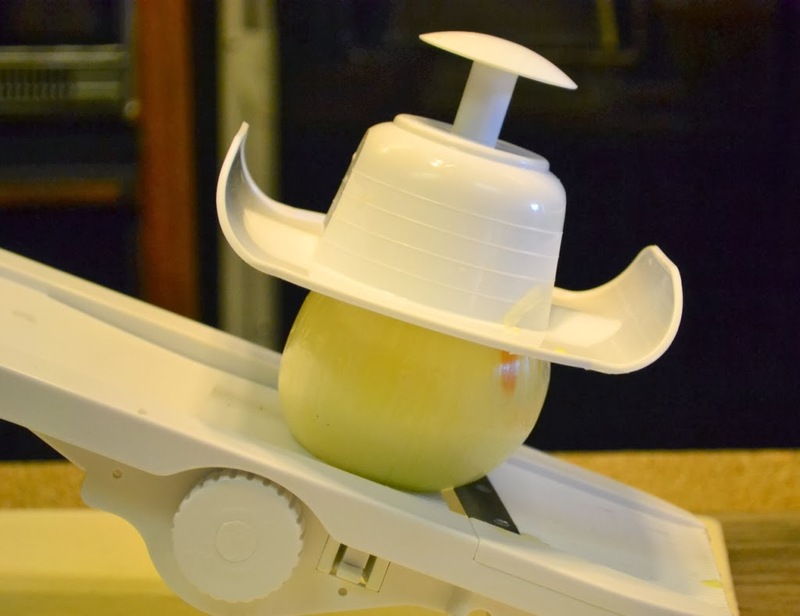 You will definitely want to use the guard when slicing the onion. Wash pickles thoroughly, removing dirt and spikes. Cut off stems and a slice from the blossom end. 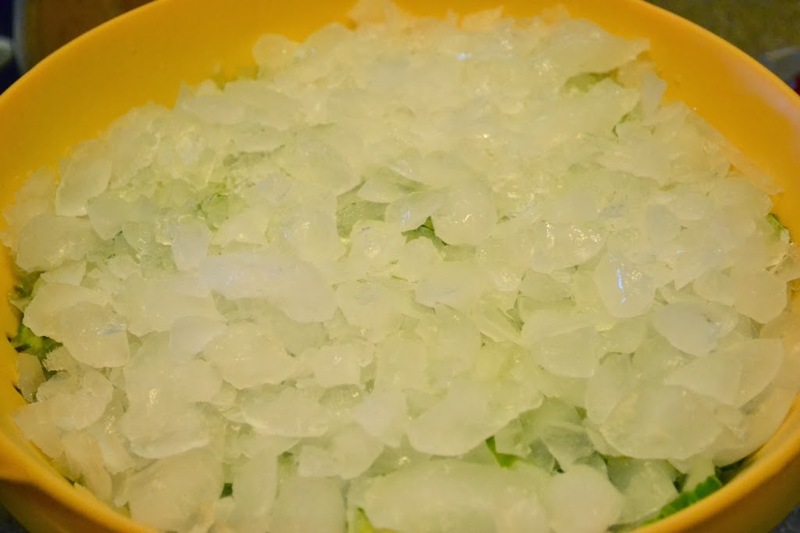 Place pickles, onions and 1/3 cup pickling salt into a large bowl and gently mix, taking care not to tear the pickles. Add a layer of ice to the bottom of colander; add pickle mixture. Place colander in an extra large bowl. Add a layer of ice to the top of pickles; cover with a dinner plate. Pour off water in bottom of bowl. In a large saucepan bring 4 cups water, 3 cups vinegar, 3 T. sugar and 2 T. salt to a boil. Prepare pint canning jars, rings and lids. 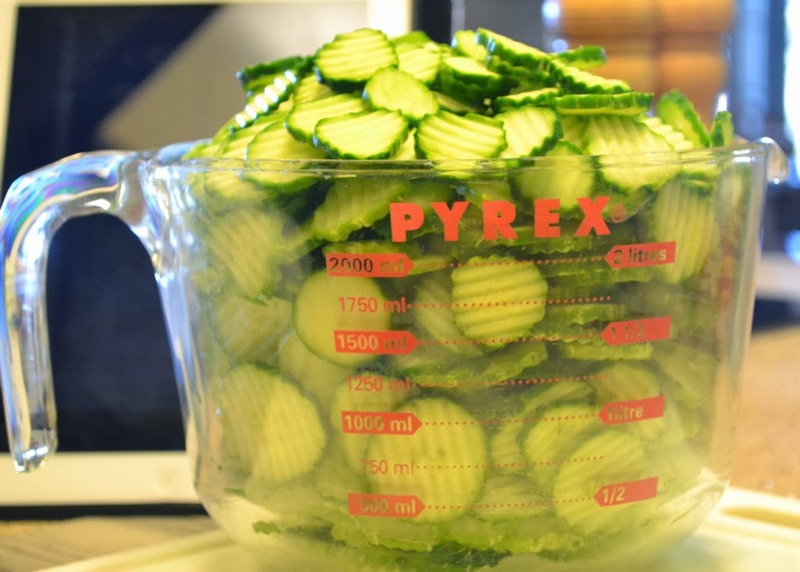 Loosely fill jar with pickle mixture and 1 tablespoon dill seed; leaving 1/2-inch headspace. Ladle pickling brine to cover pickles. Wipe rims with a clean cloth. Adjust lids and screw on rings. Hot water bath jars for 10 minutes, adjusting time for higher altitude (I'm at 1200 ft. so I add an extra 5 minutes). Remove jars to a towel, on a draft free counter. Check lids to make sure they have sealed. Wipe jars; store in a cool, dark place. 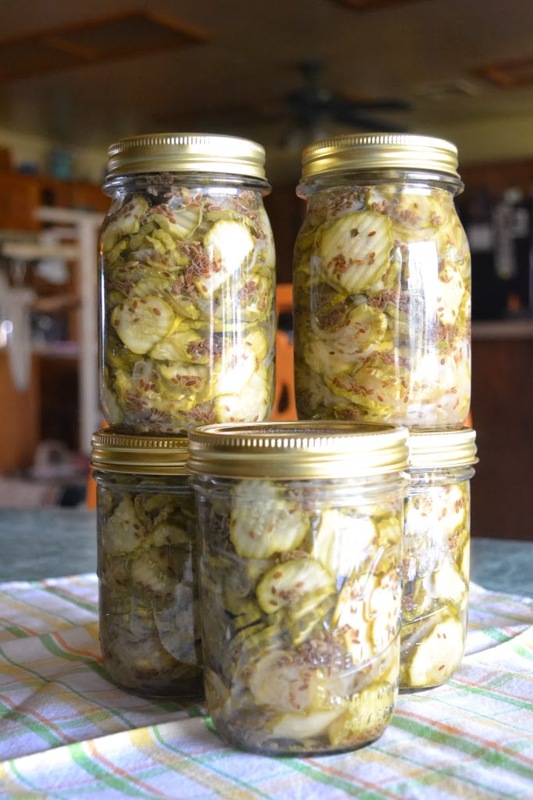 Let pickles cure for 2 months before eating! Pickles covered with ice . . . Ready for the dinner plate and a night in the fridge. Pickles the next day! I did need to gently remove the top ice and a bit of ice in the bottom. 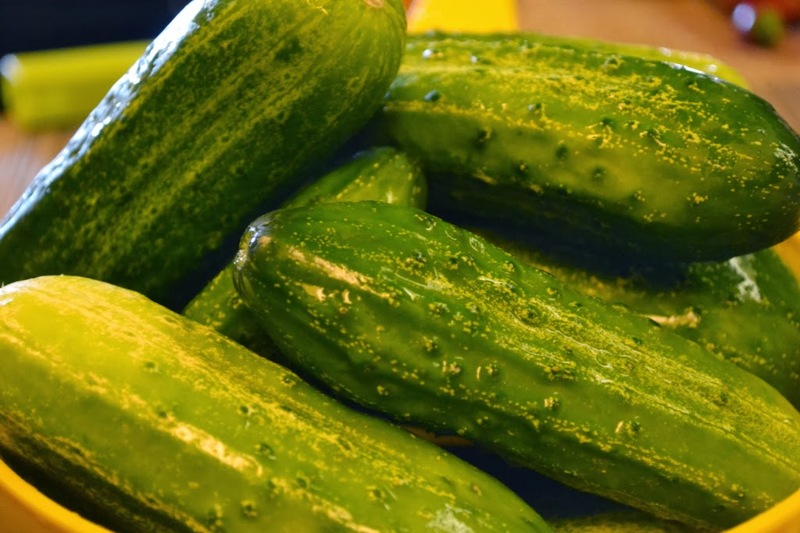 In a couple more days there will be new cukes ready to use, and I'll be making Bread and Butter Pickles . . . Over at Julie's!!! These pickles will be eaten . . . By Will and me and our "pickle lovin" Grands!! !